These days you might be used to seeing autocomplete in Google search, or similar entry boxes. 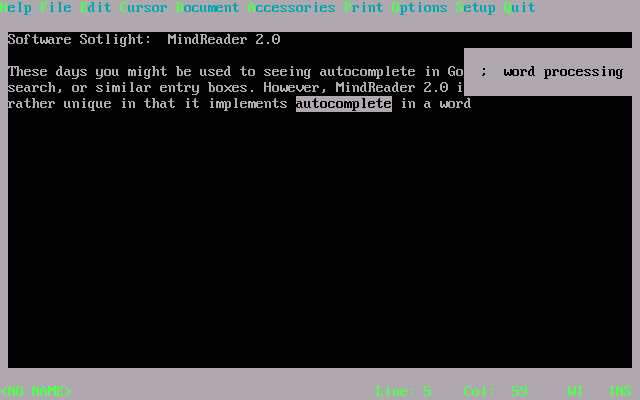 However, MindReader 2.0 was somewhat unique in that it implements autocomplete in a word processor. MindReader can recommend whole words, phrases, or entire paragraphs. It uses an "Artificial Intelligence" to learn the way you write, moving commonly used words to the top, and adding new words. 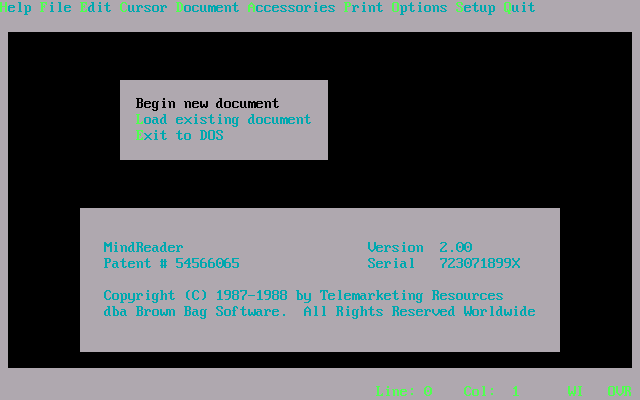 MindReader was originally written by Kalman Toth of BusinesSoft and later distributed by Brown Bag Software. A shareware version was also available. The one here appears to be a registered version. 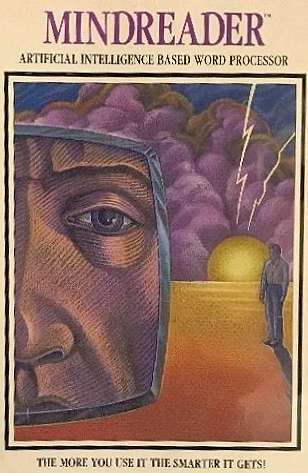 2.0 was released in 1988. It was advertised as an "Artificial Intelligence based word processor". It is primarily intended for use by non-professionals who need to repeatedly write similar, but not identical, documents - yet not similar enough for templates. As you type, boxes will pop up letting you select a complete word or phrase. MindReader also features user customizable macros and boilerplates, and includes mailing list functionality. Reviews criticized it for its awful default color scheme, (which seems to behave differently in different environments), and over-use of sound effects. I tried it out for myself, and it really didn't seem that useful. 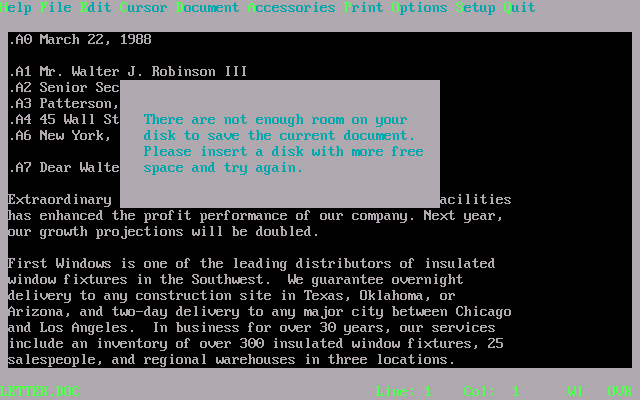 Off hand, I didn't see any way to feed the "AI" existing documents other than pasting then in through a DOS window. The majority of its suggestions seemed irrelevant, and the auto complete does not really act as a spell checker. To get it to suggest entire phrases, I had to manually add them to the dictionary. I also ran in to a bad bug. When saving a document it checks the amount of free space, and if that space is too much, it says there is no space and refuses to save. From a business use standpoint, it seems like the inconstancy between suggestions would be an issue, especially if multiple users used the same copy. Some businesses could frown on pieces of their documents being automatically stored in a dictionary, although it looks like it sticks to individual words unless the user manually adds a phrase. It is also not clear how large this database can grow. 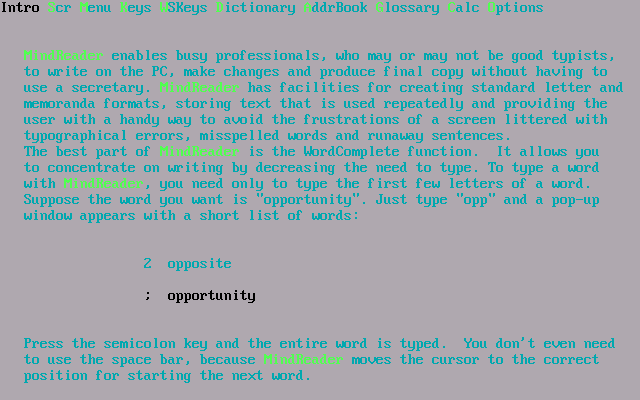 Being a DOS program, I assume the dictionary is limited by RAM and disk space. 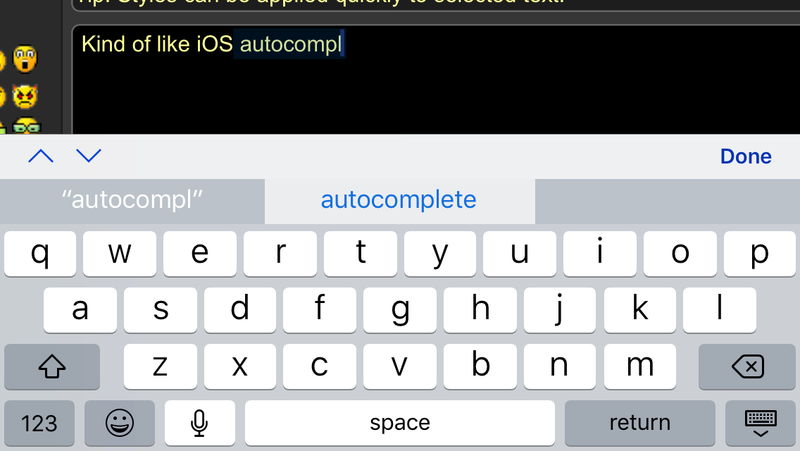 Kind of like iOS autocomplete, no? Libre Office also has an auto complete feature. Though I find it to be more annoying than anything else. It's pretty neat to see the mobile phone autocomplete's great-grandpa. I'll admit that lime green isn't my favorite, so I can see what they mean about the color scheme. I could see this being used by law firms and the like. Especially places that often use longer complicated words/phrases in Greek/Latin. I wonder how many copies they sold and what the limitations of the shareware version were. This was before HIPAA, so I wonder if doctor's offices might have gotten use from this. (Not sure if HIPAA would even apply since it likely wouldn't store the patient's information) I'm not sure if they were regularly digitizing patient information at that point. It's not like today where my doctor brings a tablet into the exam room.